As we dive deeper into the genes and proteins that have guided the development and evolution of the brain, we are now realizing the role these genes and proteins play in devastating disorders like Alzheimer’s. Franck Polleux is among the first to explore how human-specific genetic changes may impact the development and function of key circuits in the brain underlying cognition — a process that could help explain our extraordinary capacity for complex thinking. At Columbia’s Zuckerman Institute, Franck Polleux, PhD, is tracing the origins of our extraordinary capacity for complex thinking. His work has led to surprising discoveries about one of our brain’s most formative foes: Alzheimer’s disease. Creativity. Language. Complex problem solving. These uniquely human traits are ultimately tied to our uniquely human brains. Uncovering how our brains developed the capacity for unparalleled cognitive thinking is an enormous task. 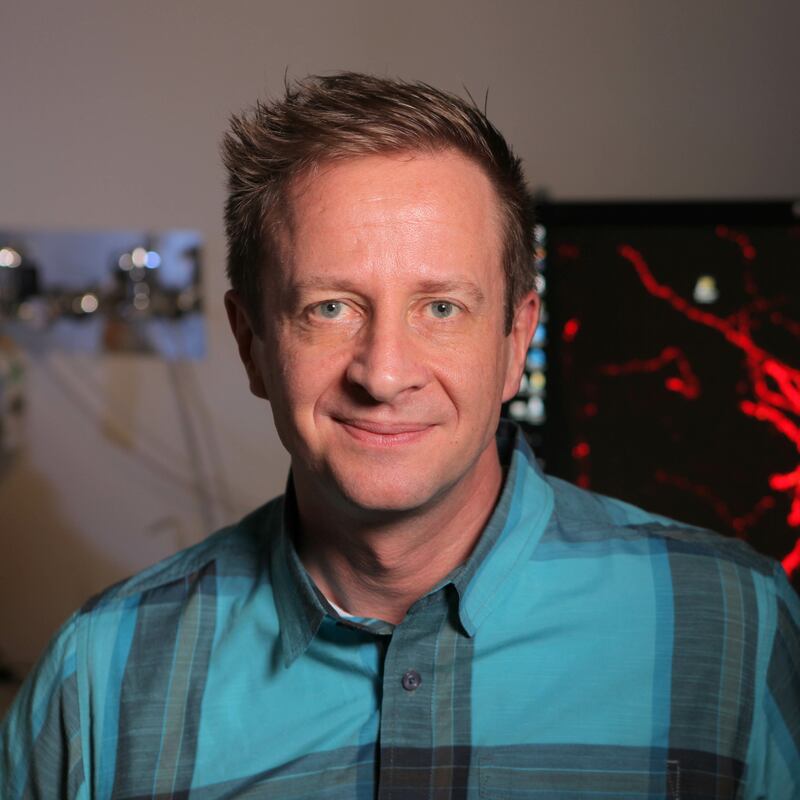 At the forefront of the field, Franck Polleux, PhD, was the first to explore how genetic changes specific to humans may impact the assembly of key brain circuits. He now investigates whether this assembly process may underlie the enhanced cognitive abilities that characterize the human brain. Dr. Polleux has spent his career studying how the trillions of connections in the brain are wired together. Hidden inside these connections lie clues to the roots of human cognition and our susceptibility to disease. One of the goals of his research is to uncover what makes these connections so specifically human. Tracking down a causal link, if such a link even existed, would be breaking entirely new ground — not only for Dr. Polleux, but also for the field. That is because one had ever attempted it. In 2006, Dr. Polleux’s laboratory started studying the gene SRGAP2. They soon discovered that this gene regulates many critical aspects of brain development. A few years later, other researchers found that SRGAP2 belongs to a selective group of genes that have been duplicated in humans and only in humans. As the name implies, gene duplication occurs when a region of DNA is copied and then inserted elsewhere in the genome. The finding that the SRGAP2 gene duplication was unique to humans raised a central question: Could the human-specific gene copies of SRGAP2 play a role during human brain development? Dr. Polleux and his team have spent the last several years making critical strides toward answering this very question. Dr. Polleux’s work has also led to startling insights into a devastating neurological disorder: Alzheimer’s disease. Several years ago, while working to identify genes and proteins associated with the brain’s higher cognitive functions, he and his team stumbled upon the protein AMPK, which at first glance appeared to direct the healthy growth of neurons. Upon further investigation, however, the researchers identified another, more sinister role for AMPK: It was associated with a protein called amyloid beta, a major culprit of Alzheimer’s disease. “Normally, the brain contains low amounts of amyloid beta, but in Alzheimer’s, that amyloid beta builds up to form harmful plaques in the brain,” explained Dr. Polleux. 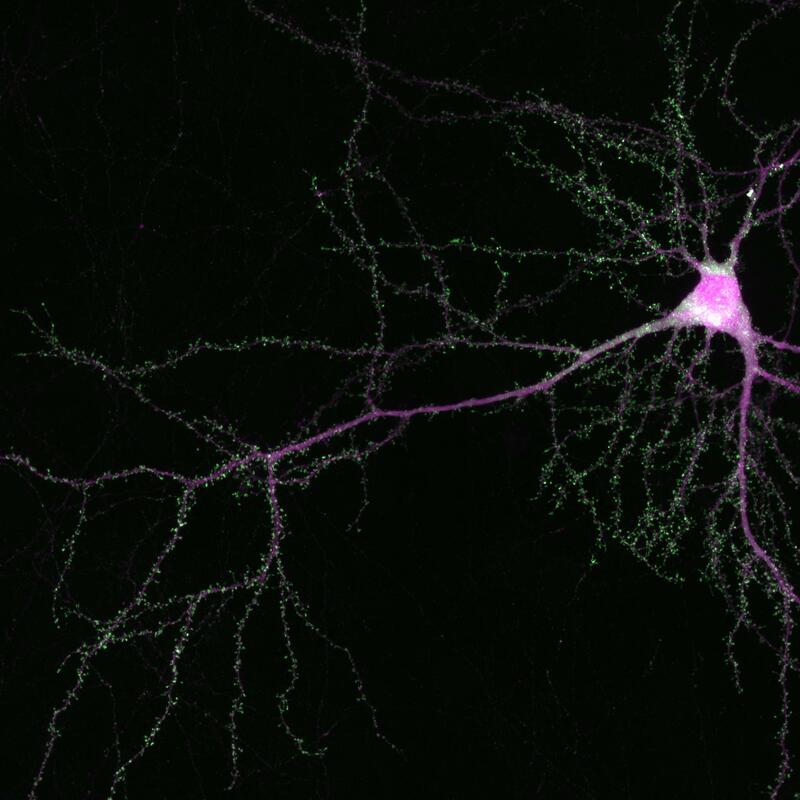 These plaques damage neurons first by causing them to lose their synapses — the physical connections between neurons that are so critical to healthy brain function. As the plaques continue to grow, the neurons themselves are damaged beyond repair. How could they tell? When they removed AMPK from the brain in their mouse models (by switching off the gene that normally produces it) amyloid beta no longer led to a loss of synapses. And in a completely unexpected twist, the researchers found that a lack of AMPK also prevented the buildup of another protein called tau, the second major hallmark of Alzheimer’s. These findings, published in the journal Neuron in 2013, have been critical to several avenues of Alzheimer’s research. First, they suggest an entirely new therapeutic focus — AMPK activity — to treat, or even prevent, the disease’s harmful effects. But the study also revealed something more troubling about a seemingly unrelated condition: type 2 diabetes. Today, the single most common type 2 diabetes treatment is metformin, a daily pill that regulates blood sugar levels by boosting AMPK activity in the pancreas. But could metformin also have an effect on AMPK activity in the brain? 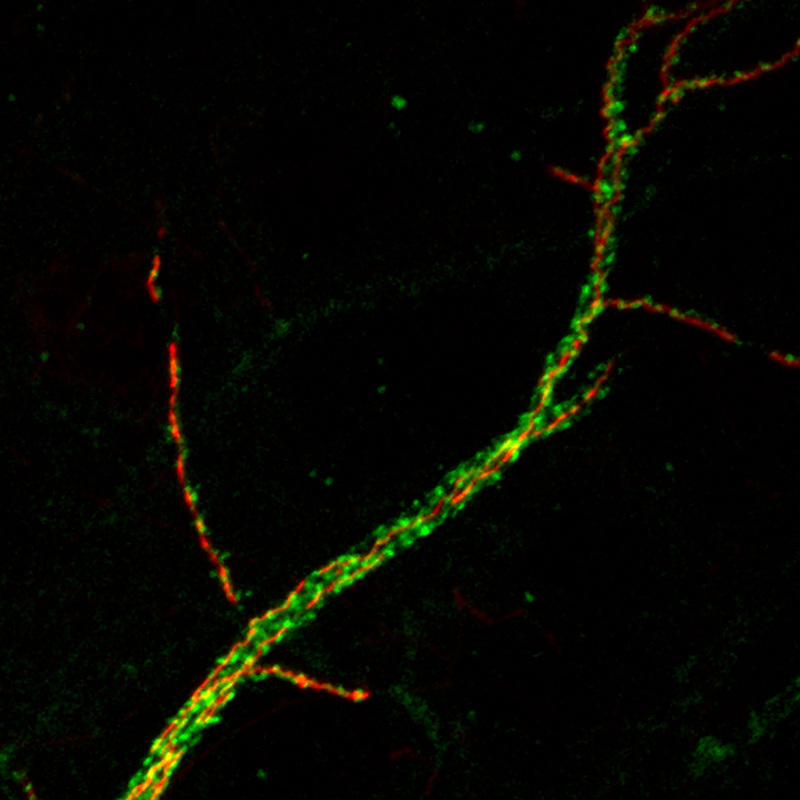 Working together with collaborators at Columbia’s Taub Institute for Research on Alzheimer’s Disease and the Aging Brain, Dr. Polleux is continuing to investigate this question, and to dissect the chain of events in the brain that leads to overactive AMPK and, ultimately, to Alzheimer’s. Having spent the majority of his career focused on exploring molecular and cellular mechanisms underlying brain development and the origins of human brain evolution, Dr. Polleux’s more recent foray into disease research reveals that basic, or foundational, research can inform clinical research in unexpected and powerful ways. LKB1 Regulates Mitochondria-Dependent Presynaptic Calcium Clearance and Neurotransmitter Release Properties at Excitatory Synapses along Cortical Axons. Franck Polleux, a professor of neuroscience, joined the Mortimer B. Zuckerman Mind Brain Behavior Institute in 2013, where he studies the early brain development in mammals as well as the parts of the brain that lose synapses during early stages of Alzheimer’s disease.